The surface properties of materials are very important, and researchers attempt all sorts of methods to obtain materials surfaces with required properties. With the development of bionic engineering, researchers are paying an increasing attention to biological surface in order to understand how the nature can solve engineering problems. The extensive investigations on biological surfaces have revealed that these surfaces have many unusual properties. The “lotus-effect” is a typical phenomenon that the natural surface structure as blueprint is used to design and fabricate engineering materials surfaces. 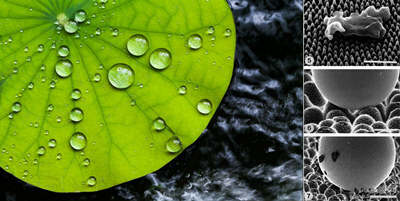 The binary microstructure of lotus surface endows super-hydrophobicity, which can adapt to environmental conditions well . In recent years, the super-hydrophobic biomimetic surfaces have been studied extensively due to the necessity of self- cleaning materials, micro-fluid device and others . The bio-inspired super-hydrophobic surfaces are prepared by many methods according to physical and chemical principles, such as lithography, template method, sublimation, electrochemical methods, layer-by-layer methods, bottom-up approach for fabrication of nano-arrays and so on. However, researchers usually fabricate hydrophobic films on metal materials and inorganic materials surfaces with the stable chemical property. Consequently, reactive metal and their alloy surfaces are rarely investigated. Magnesium is one of the lightest engineering materials. Thus, it is expected that magnesium and its alloys will be used in aerospace, aircraft, automobile, and railway applications. A hydrophobic coating would be a promising technology for improving surface performance. Jiang et al. fabricated a super-hydrophobic biomimetic surface on a Mg-Li alloy through chemical etching, followed by immersion and annealing processes using fluoroalkylsilane (FAS) molecules.Similarly, Ishizaki et al. created a super- hydrophobic surface on a magnesium alloy by immersion in a cerium nitrate aqueous solution (20 min). Jun et al. created a stable biomimetic super-hydrophobic surface on magnesium alloy fabricated by microarc oxidation pretreatment and followed by chemical modification based on lotus effect. Li et al. prepared magnesium thin films by bias magnetron sputtering. Xiang X, Fan G L, Fan J, et al. Porous and superparamagnetic magnesium ferrite film fabricated via a precursor route. J Alloy Comp, 2010, 499: 30–34.